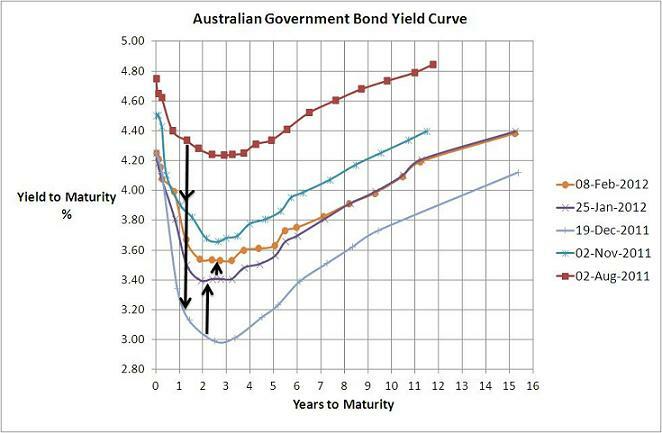 When I saw the headline in the Market section of today’s Australian Financial Review I thought bond yields must have gone through the roof but the above chart shows that there ‘s only a relatively small increase compared to a couple of weeks ago. Markets had obviously priced in a rate decrease from the Reserve Bank and when it surprised by leaving rates on hold the market had to readjust…hence the shorterm term yields increasing by up to 10bps. Yields still aren’t quite up to November levels and the market is still not at all bullish on the Australian economy. The movment from the December lows are support for the ‘green shootswith overseas data…US finally had an actual decent employment month and Spanish & Italian bond yields are still trading far below their catastrophic levels. Long way to go so there’s still no harm staying underweight risky assets as the downside still appears to be greater than the upside this year.